The fact that I was funemployed gave me no excuses not to fly to Luzon and the fact that I had not participated in any ultra trail race in the country this year gave me the one big reason to register in the 3rd edition of the King of the Mountain trail race! A colleague heard about my resignation and immediately messaged me about a three-week project in Canyon Woods in Batangas. So, I flew in from Cebu on the 27th of April. The place was just perfect for my training. This hilly private residential resort affords chilly fresh air, empty paved roads and an uninterrupted vista of Taal Lake! On May 1st I borrowed a friend’s mountain bike. I rode it all the way from Pala-Pala to Canyon Woods. At first, I was scared of highways so I took the Amadeo route instead of Aguinaldo Highway. That was my first official ‘padyak’ and it was 50km! Every afternoon I would have my regular jogs and bike rides in the village. The next weekend I rode the bike down to Laurel,and I waited for my training buddies Kevin Jauod and Rey Ali in Tanauan, Batangas. They biked from Dasma up to Tagaytay before joining me down at Tanauan. 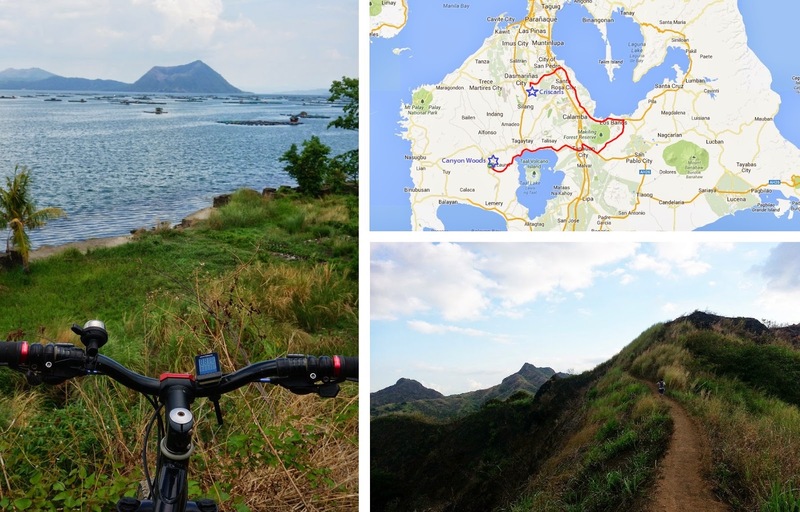 We rode around Mt Makiling through Batangas and Laguna before terminating at Christian Zamora’s carwash in Cavite where I returned the bike. That 100km bike ride took my ‘highway-phobia’ away! On my third weekend, I was again joined by Kevin and Uls Buelos for a late afternoon Mt Batulao run. It started smooth but in the uphill boulder section, my right calf got cramped. Kevin and Uls were timing me at the junction. Without anyone to assist me, I was precariously stuck on the 50-degree slope pinching on the jagged surface of the boulder but I managed to give my leg a little stretch and I moved on…but I moved cautiously slowly because my aching calves were continually threatening cramps! It took me about two hours to complete the loop right before darkness swallowed the mountain. Then my project finished. It was time to head for Benguet. I know how thin air can affect one’s performance so I capitalized on my being funemployed and found time to acclimatize to high altitude. Kevin happened to be out of work too so he joined me. A last minute text message came in from an elite runner and trekking friend Koi Grey. The three of us arrived in Ballay, Kabayan, Benguet (2100+ masl) late in the afternoon on May 20th. The rain made us forget about the scorching summer heat of Manila as if the near-freezing temperature of Ballay was not already enough. We stayed at the home of the trail running prodigy Josiah Ballagan. We played everything by ear afterwards. The only plan was to be at high altitude. The cold made all three of us lazy to sneak out of our blankets in the mornings. But we still squeezed in a few training sessions. On our first day, we climbed a mountain nearby. We were pounded by rain at the summit (2600+ masl). On our way back, we were dodging lightning bolts in the midst of the freezing downpour. And the thunderclaps were like the applause of the gods watching us. It was especially scary for me as I was always at least 500 meters behind. Josiah, Koi and Kevin were running effortlessly quick. Kevin would always be the one to stop and wait for me. And I thought to myself ‘These are the real racers. I’m just a wannabe.’ I was so demoralized that I resolved to just go to the race venue on the 24th and get my KOTM shirt and not join the race. On our second training day (May 22nd) we visited the four lakes in the area. It was a light trek but on our way back down, the three again showed me how technical downhill run is done. I was hopelessly trailing behind them ever careful not to get myself injured two days before the race. Those were the two physical trainings we did before the race. Outside training sessions, we were either playing chess, pusoy dos, or practicing our headstands and other yoga poses. 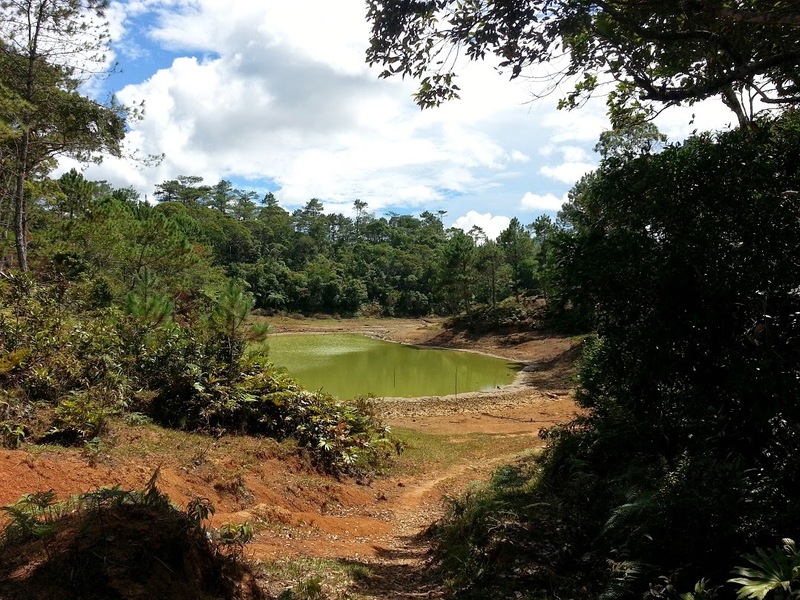 On the 23rd we headed for the race venue—Kayapa, Nueva Vizcaya! When we got to Kayapa Central, Lendl Reyes, another Mountain Stride runner, was already waiting for us. He got us bed spaces at the parish convent. It was very difficult to find accommodation the day before the race so we settled for the convent basement. During the race briefing, I saw my Runlaon XL buddy Xerxis Tan. I asked if I could room with him, to which he readily assented. So instead of the ten-person room in the parish church, I spent the night in a room with Xerxis and the elite racer Thumbie Remigio. I was feeling awkward towards Kevin and Koi, but yeah, at times you gotta make compromises if you wanna give your optimum performance. The race started at 4 a.m. on the 24th. Koi and another Mountain Stride runner Rey Ali were there for moral support. 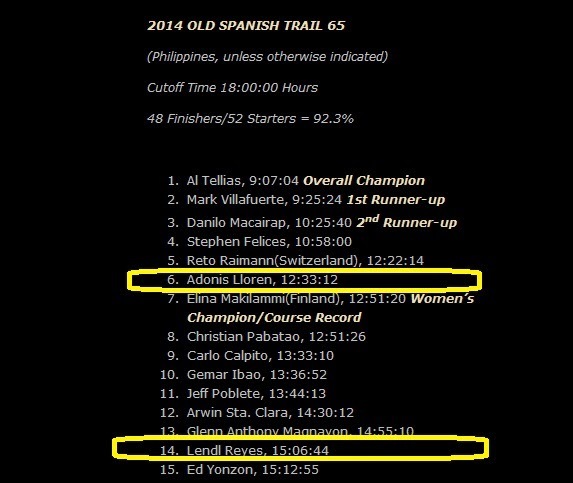 There were 52 runners for the Old Spanish Trail (65km) and 64 runners for the Four Lakes (100km) at gunstart. I was at the tail of the lead pack during the first ten kilometers of the race but my calves started sounding the ‘cramp alarm’ when we reached the uphill section. Cramps had always been my obstacle in races. I had been trying to find a solution to this mystery: from yoga stretches to electrolyte drinks. But this time I tried the basic one—pure salt. Every time I was on an uphill section, I would slow down and swallow a pinch of salt. As I slowed down, Lendl who was also running the 65km distance caught up with me and soon after Kevin came from behind smiling. He said he started second to last. He was running the 100km distance while running a fever. 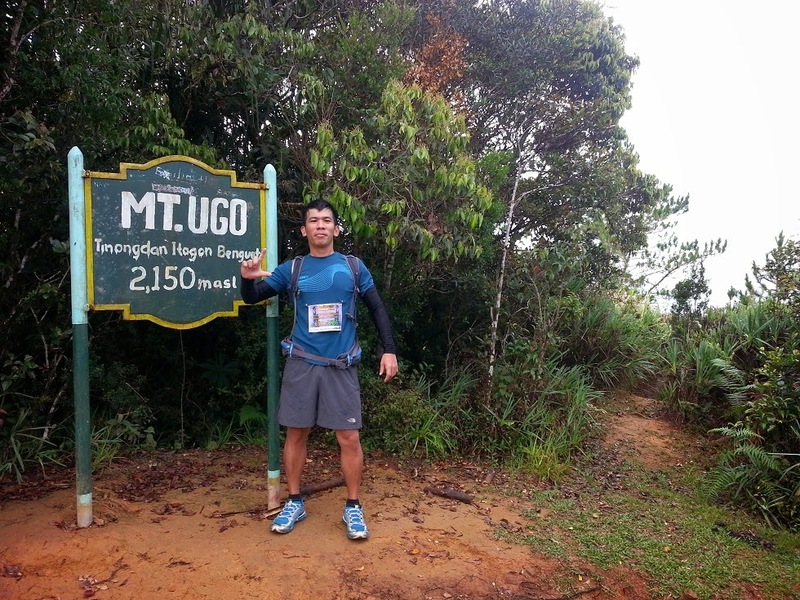 When we got to the downhill section, I did my ‘hobbit run’ and I felt as energized as I was in the TNF100 Thailand. I sped past a lot of runners including a mountaineer friend Patrick Aquino until I got to the 17km aid station. I snatched an apple and gulped down a cup of Gatorade. Kevin followed asking for some tissue. He started feeling incontinent. I had none to offer him so he had to wait for Lendl. I went on with my ‘hobbit run’until I caught up with Xerxis and a newfound buddy Doi, a fellow Waray who was running the 100km distance. Doi and Xerxis would be my ‘packmates’ during most of the race. I never saw Kevin and Lendl again in the race. At 3km to the summit of Mt Ugo (the highest point in the race) we saw Marcelo Bautista running down with James Tellias just 50 meters behind. The trek to the summit of Mt Ugo was not really taxing for my muscles and my breathing thanks to my acclimatization and the spoonful of salt. I was the 17th to get to the summit, just about a hundred meters behind Reto, the runner from Switzerland. When we got back to the 17km AS (which was now the 24km AS), I assisted Doi in refilling his water bladder. As I felt lazy to refill mine, I went on even though I knew that the next aid station would be 11km away. That was mistake number one! After like 7 kilometers I ran out of hydration. But I couldn’t be sure with my estimate so I convinced myself to find some water. As a rule of thumb, you don’t ask for hydration from other racers. Wait until they decide it’s a life-and-death case for you. Water was never really a problem for me because during my mountaineering days, I could sustain long and arduous treks with just 30ml of water. But during the race, I was still experimenting on my nutrition so I was paranoid that little hydration might contribute to cramping so it was more of a psychological strain than a physical one. When I saw a cluster of houses, I told Doi to go ahead. I went to the houses asking for water but no one was around except for a dog and a disabled girl who could neither walk nor communicate. I saw the same thing in my Benguet- LaUnion cross-country trek before—a child suffering from mongolism is left home alone with a dog while everyone else is farming. I was giving gestures outside the fence but to no avail. So, fearing that I might agitate the kid, I went on alone and psychologically thirsty. A few more kilometers later, I saw another cluster of houses…this time, with people. I was both so exhausted and excited to go down to the houses that I tripped and twisted my right ankle. Before I fell and screamed, I heard something close to the sound of a bone that snapped. I felt a short sharp pain in my ankle. Then panic came! ‘Damn! I’m never gonna walk again. I’m never gonna walk again!’ And in a split second, like a crumbling stack of dominoes, I imagined the phrases falling. ‘No more trekking’, ‘No more rock climbing’, ‘No more biking’, ‘No more trail running!’ I had never felt tragedy that intense before! I’m not really sure but I think out of desperation, I said a little prayer. Then I started feeling my ankle and moving it a bit. There was movement! I thanked God (I seldom do). Then a man helped me up. He sat me down and gave me water. Luckily there was a ‘manghihilot’ in the neighborhood. He massaged the affected area and pressed on about five points around the ankle and I responded with a grimace every time there was pain. ‘Wag kang mag-alala, wala kang bali. May naipit lang na ugat’ he reassured me. 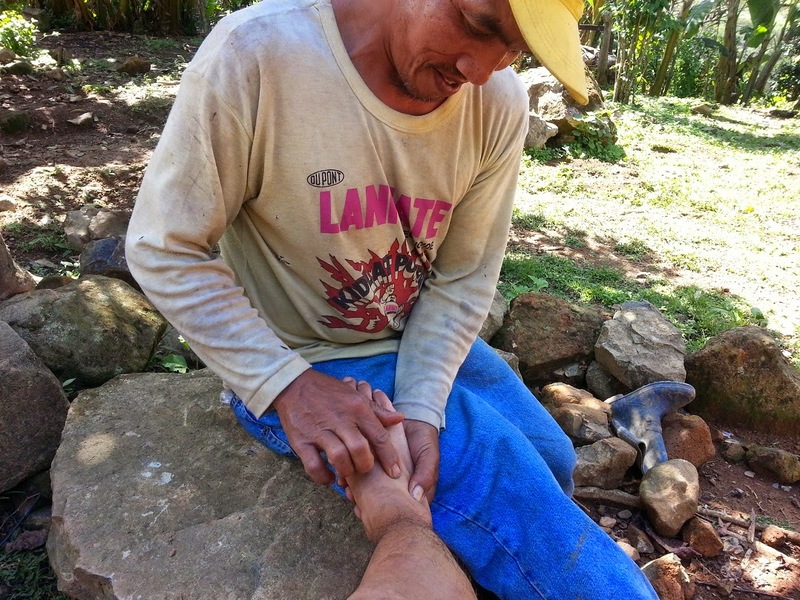 Then without warning, he gave me this most painful press on my ankle and twisted my foot inward. I screamed. But I felt much more comfortable and safer. I thanked him. That was all I could offer him. ‘Sa Diyos ka magpasalamat ading.’ Then with just a few teeth showing he started laughing and so did everyone else in the crowd. It was a contagious yet therapeutic laughter so I joined in. While watching other runners going down the hillside, I took a rest and walked around for a while feeling happy with my functional ankle. I was ready to accept my first DNF! Y’see, lack of hydration can lead to other problems even more serious than dehydration. I don’t get tired: I just get cramps! After enough rest, I left the neighbourhood and joined the other racers. I was on my way to the 35km AS and ready to declare a DNF. But as I was walking I felt almost no pain in my ankle even when I started skipping. I tried running and it was fine. I didn’t have to declare a DNF after all. Then I caught up with Patrick again ‘O, Adonis! Naligaw ka?’ ‘Hindi. Nagpahilot lang’. Then we arrived at the 35km AS around 9:45. Then I thought to myself, ‘35km in less than 6 hours! I can do an under-12-hours here!’ Xerxis was already there sitting on a table. ‘O, akala ko nasa top 4 ka na! San ka galing?’ ‘Nagpahilot lang dun sa mga bahay bahay sandali.’ It was a festive aid station. Everyone had a story to tell and plenty of food to thank for! Epoy, Patrick’s pace buddy was also there. He approached me and said ‘Tol okay ang time natin. Number 6 ako. Number 7 ka. Maintain nalang natin yan!’I was hesitant to give any reply other than a forced nod because I was still undecided whether to continue or to DNF before injuring my ankle more. Four runners left one by one. First it was Reto, then the Japanese guy, then Xerxis and then another runner. Then I remembered Sir Jonnel warning us how aid stations could delay a runner so when the clock hit 10:00 I invited Epoy to go on but he just said ‘Sige mauna ka na muna!’ It turned out they were still having some halo-halo made. The very helpful and attentive marshal there kept reminding every one of us that the next aid station was still 21km away (at Day-ap). So, learning my lesson from mistake number one I refilled my hydration bladder before leaving. This was the most challenging part of the 65km distance. It was a long uphill trek to Amelong-Labeng. The steep ascent started after crossing the long hanging bridge. It was good for me because my injury was only affected by downhill movement. The first one I caught up with was the last runner to leave the 35km AS. Then I went past the Japanese guy…and then Xerxis. It was here where I learned a very important lesson in long-distance races—When the going gets tough, move slow but never stop. I noticed that Xerxis never stopped even though he was struggling to move up. As for me, the regular salt intake seemed to be working so I kept climbing. My legs are made for climbing. And unlike many others, I was not gasping for air. Soon after, I said hello to Reto. When the trail got flat, I started running fast and when it declined I started running faster. I sustained that speed for about 30 minutes until I caught sight of Doi again. I was relieved to know that I was in my pack again. But Doi quickly disappeared from view ahead and Reto was nowhere to be seen behind. I was alone again. I had already gone past two towers and I started to get impatient so I asked a farmer where Day-ap was. He pointed at the top of a hill across the valley in front of me and he said it was about three hours away. I started feeling tired. So I walked again. It was the first time I felt really exhausted in a run. But I was relieved. I knew what my optimum performance was. It was from this time on when I kept repeating my short prayer ‘Lord, give me the strength and the fortitude to finish this race!’ Then Reto came from behind with long strides. I continued dragging my legs and when the trail reached the road, I felt defeated. I was just purposelessly walking. I had no idea how long the road section was gonna be. I dread road sections. It really pays to study the course map beforehand. But to my surprise, I saw a girl waving her arm not so far away. It was the unexpected Castillo Village AS. Al, another housemate, was taking a rest there. The marshal said it was already KM49. I was like given this shot of adrenaline when I heard it. So shortly after having a sip of the water there, I started climbing up without refilling my bladder. Mistake number two! Seven kilometers was way longer than I estimated. I got exhausted again as we approached Buaka Lake. There were four of us in the pack now—Al, Doi, Reto and me—all feeling exhausted by the distance and the heat of the sun. When we found the trail sign after Buaka Lake, Reto and Doi sped ahead. I kept walking. And it was downhill again. At the foot of the hill, Al chose to take a rest while the two disappeared in the thick uphill section in the pine forest. I kept dragging my legs and all of a sudden, I saw Xerxis and the Japanese guy again running down the slope. Xerxis was moving with amazing dexterity that in no way resembled his struggle up Amelong-Labeng. There was no sign of exhaustion on his face and voice. ‘Sa kanan’ he shouted from behind when I entered the wrong trailhead upwards. The landscape in the final uphill trek to Day-ap was very inviting. It was chilly and windy but I knew that sitting down would make me wanna sit longer so I moved on. It was a relief that Xerxis and the Japanese guy were already with me. I had to break the rule of thumb and asked Xerxis for water. More than just water, he offered even the chocolate bar in his pack. Yeah, I’m not gonna deny it: I was a leech to Xerxis that time. Then he told us that the Day-ap aid station was actually just less than a kilometer away. This news energized us so we climbed harder. Finally, we arrived at Day-ap! James Tellias who had DNF’ed due to ITBS was helping the marshals to attend to the weary runners at the aid station. I ate two morsels of adobo and the peanut butter sandwich that I had been hallucinating about while I was wearily dragging myself to this final aid station. All of a sudden the Frenchman leading the 100km distance was back at KM56 (now KM82 for him). Everyone was cheering for him, excited that he was about to set a new course record. In less than a minute he was gone again. Xerxis, who was still to travel 44 kilometers encouraged me to move on. ‘Swerte mo 9km ka na lang…puro pababa pa.’ I wasted no more time and I bade him goodbye. After a 4-km downhill run on a dirt road, I reached the highway. And it felt like I had just began the race. I ran faster than ever in the race until I arrived at the finish line! It had been a very good performance! I had initially planned to improve my 50km time last year but because of the lousy organization of last year’s event, I forewent this year’s TNF100 Ph. I still have two ultra trail marathons coming up this year but both are outside the country. Checking the local trail running calendar, I made no scruples in choosing the King of the Mountain. Apart from the catchy name, it was the organizer and his advocacy for Igorots that gave me the biggest reason to join the King of the Mountain trail run. 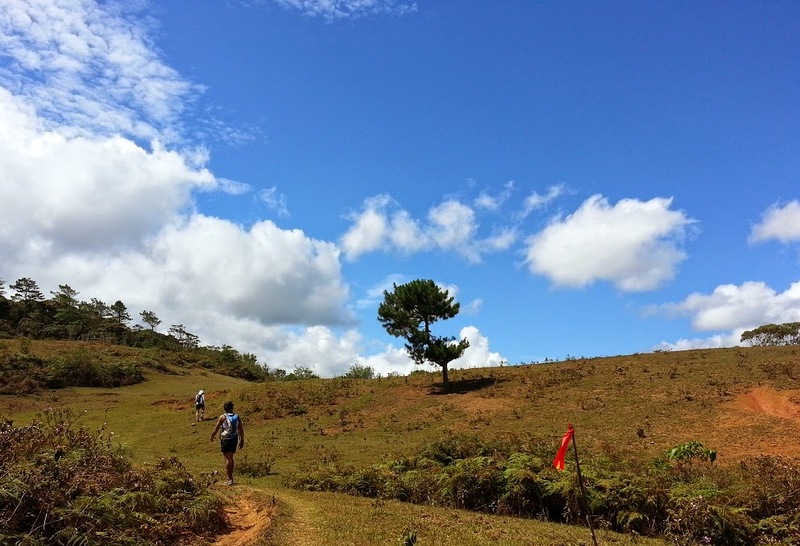 KOTM has gained popularity among local and international trail runners due in large part to the wisdom of the man behind the event—Frontrunner magazine’s Jonel Mendoza. He is not backed by big corporate names but each race he organizes delivers more than what it promises! It leaves no room for whining and a lot of room for camaraderie and self-fulfilment. What I liked most about the race is that, you’ll never feel anonymous there. He and his wife will address you on a first-name basis at least five times at the finish line congratulating you, attending to your needs and getting to know you more personally. This personal touch of Sir Jonel runs all the way down to each marshal and member of the crew. It’s no wonder each and everyone in the race knows him not as ‘the organizer’ but as Sir Jonel. I had earlier resolved to quit running next year but I guess I’ll have to stall my retirement for a while to make room for another KOTM run…perhaps a 100-km this time. Victory Favors the Prepared...and The Resilient! I felt victorious not only for my very good time, but also because I was able to enjoy the trail and made a handful of new friends. I also felt happy for the success of my friends in the race. Xerxis finished 11th in the 100km and Thumbie came in 6th despite his ITBS. Lendl finished 14th in the 65km. But I guess the most worthy of praise is Kevin. As I mentioned earlier, he was running a fever during the race. But as Lendl recounted, Kevin waited for him at least five times to give him moral support and companionship. Lendl broke away after Amelong-Labeng and just gathered reports about Kevin from other runners. The last report he got was at Day-ap and it said Kevin was just sitting somewhere near Castillo Village. We were very worried that he had not arrived at 6am the following morning but we knew he was a fighter. I would have quit if I were him. Finally with a raspy voice and a runny nose, he reached the finish line after almost 27 hours placing 31st among the 64 runners in his category at the starting line. It has been a very wonderful experience. I have a lot of people to thank but I guess I’ll just send each reader a message that finishing a race takes more than just strength and courage! And that a DNF is never a sign of weakness. Congratulations to all the warriors in the race.